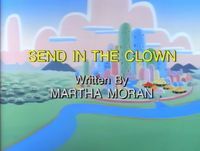 Featured Song "The Greatest Show in the World"
"Send in the Clown" is the third episode of the Super Mario World animated series. Outside in a field, Mario and Princess Toadstool are in the middle of a tennis match, using fireballs from a nearby Fire Plant as balls. As Princess Toadstool scores a point against Mario, she is congratulated by Luigi, who is acting as the game's scorekeeper. Princess Toadstool than proceeds to hit another fireball to Mario; before Mario can hit the ball though, Yoshi, the game's ballboy, gobbles it up. Mario and Princess Toadstool in a tennis court with Kootie Pie Koopa putting up a poster. Mario proceeds to scold Yoshi for eating the ball, saying he is not supposed to eat them, he is supposed to catch them and only when they are out of bounds. As Yoshi calls tennis "un-fun", the scene zooms out and shows Kootie Pie Koopa and Big Mouth Koopa putting-up posters for the "Koopaling Bros. Circus". As Big Mouth begins to ramble and yell at Kootie Pie, the annoyed Koopaling shoves a poster in Big Mouth's face. As Kootie Pie and Big Mouth continue to put-up posters, King Koopa flies overhead in his Koopa Clown Car and using a conch shell, begins to make announcements about how the cave-people can visit the Koopaling Bros. Circus for free. The cave-people follow Koopa to a Warp Tube which leads to "the circus". As the cave-people enter the pipe, Koopa snickers to himself, saying that he hopes his dinosaurs enjoy a "cave-people casserole". Mario and Princess Peach are still playing tennis, with Princess Toadstool winning. As the Fire Plant launches another ball, Mario makes a futile attempt to chase it, with Yoshi running after him. Mario and Yoshi end-up tumbling into one another. As Mario is helped up by Luigi and Princess Toadstool, he notices that all the cave-people are missing. As Mario, Luigi, Princess Toadstool and Yoshi look around, Luigi notices a Koopaling Bros. Circus and panickingly states, "Oh no! Koopa's at it again!" Using the Star Path, Mario, Luigi, Princess Toadstool and Yoshi warp to Neon Castle in search of the cave-people. Entering Neon Castle, the group notice that there really is a circus tent in it. Entering this circus tent, Mario, Luigi, Princess Toadstool and Yoshi decide to watch the show and see what will happen. After a performance by acrobatic Koopa Football Players and tight-rope walking Mechkoopas, Big Mouth, the circus' ringmaster, enters and begins an egotistical speech, only to be stopped by Koopa, who has several "clowns" enter. Performing various stunts, these clowns decide to include a rambling Big Mouth in their act, much to his annoyance. After being flung into a pool of green goo, an extremely mad Big Mouth begins to chase the clowns around, much to the amusement of the show's spectators; the only person not laughing is Luigi, who still believes Koopa is up to no good. Mario rebuffs his brother's claims, telling him to just enjoy the show. It is only after an incident involving a pie-throwing machine that the clowns are revealed to be Rexes. As the crowd of cave-people flee to the exits of the tent, several Thwomps cover the doors, trapping everyone inside. Flipping a switch, Koopa and Big Mouth dump everyone in a large cage hidden under the floor. Mario in a cage with Dino-Rhinos. As Mario is hanging over the cage, Koopa begins to taunt him and shoves him into the cage. Before Mario hits the floor of the cage, Koopa grabs him and brings him back-up and, shoving a chair in Mario's arms, he pushes his "dinosaur tamer" in a cage filled with Dino-Rhinos. After easily destroying Mario's chair, a Dino-Rhino shoves Mario to the ground and, putting on a bib, prepares to eat him. As Luigi and Princess Toadstool mourn Mario's fate, the princess, remembering a Fire Flower she had, tosses it to Mario. Using several fireballs, Mario defeats the Dino-Rhino and its Dino-Torch friends. Melting the lock on his cage, Mario runs through Neon Castle searching for something he can help his friends with. While searching, Mario is attacked by an armada of enemies such as Koopa Football Players, Koopa Skeletons, Bowser Statues, Mechkoopas and a Ball 'N' Chain. While fleeing, Mario bumps into a block which shoots out a feather. Grabbing this feather, Mario transforms into Caped Mario. Using his new powers, Mario defeats Koopa's minions, flinging them at the Koopa king. Mario then proceeds to chase down Big Mouth, who seeks refuge in the circus tent. Once Big Mouth is in the tent, Mario pulls it down on-top of Big Mouth and Kootie Pie. Approaching the cage holding his friends, Mario is about to release everyone when Koopa in his Koopa Clown Car appears. Koopa from his Koopa Clown Car calls out to Mario (after calling him a plungerface) that he wouldn't do that if he were Mario; unless Mario wants to see his precious princess again. Holding Princess Toadstool captive, Koopa begins to hurl Mechkoopas and Big Steelies at Mario. Stomping on a Mechkoopa, Mario hurls it at Koopa, who easily dodges it. He than proceeds to try and crush Mario with the Koopa Clown Car. King Koopa with Princess Toadstool in his Koopa Clown Car. Evading Koopa, Mario (who tells him that he will not do any more clowning around and is being "koo-put"), grabs another Mechkoopa and hurls it at the Koopa Clown Car. Smashing into the contraption, Koopa loses control of the Koopa Clown Car, dropping Princess Toadstool out of the vehicle. Catching Princess Toadstool, Mario proceeds to release all the captives. After doing this, everyone returns to Dome City. Back home, Mario, Luigi, Princess Toadstool and Yoshi have their own circus for the cave-people, with Yoshi as the clown, Princess Toadstool as tight rope artist, Luigi as an ice cream seller, and Mario as the ring master and juggler, with Yoshi eating the rocks. Kootie Pie Koopa covering Big Mouth Koopa. King Koopa in his Koopa Clown Car. Mario just defeated in the tennis match. The warp to Star World. King Koopa's Castle where the circus is located. The circus tent in King Koopa's Castle. Big Mouth Koopa as a ringmaster. Big Mouth Koopa and the audience. Luigi wondering why King Koopa would do this. The revealing of the Rexes. Luigi and Princess Toadstool about to fall into the cage. The Cave People falling to the cage. Mario throwing a fireball in the Dino-Rhino's mouth. Mario obtaining the Cape power-up. Kootie Pie and Big Mouth are caught under the tent when Mario pulls it down. In several portions of the episode, the "L" on Luigi's hat is white on a black background. In one shot, the feet of Koopa's Rex minions are green, despite the fact that the dinosaurs are blue. The audio temporarily goes out of sync in the scene where Big Mouth gets hit with a pie while demanding respect. The dots on the outsides of the Clown Car's eyes turn from blue to red during the final battle. Moments later, they completely disappear. At the end of the episode, when Mario is dressed as a ringmaster, the costume he wears is extremely similar to the one he wears on the cover of Super Mario All-Stars a few years later, which would also become a costume he could wear in Super Mario Odyssey. This episode's final battle is extremely similar to the one in Super Mario World. As Koopa throws Mechkoopas at Mario, he throws them back, and Koopa attempts to crush him with the Koopa Clown Car. However, when the Koopa Car hits Mario, his cape does not disappear. Koopa also drops Big Steelies on Mario. Though this is Kootie Pie's last animation appearance, she has no dialogue (though she is heard giggling at the antics of the acrobats as they torment Big Mouth). ↑ May 20, 2015. "Send in the Clown", dubbed in Romanian by KidsCo. Odnoklassniki (OK.ru). Retrieved January 4, 2016. This page was last edited on April 8, 2019, at 18:15.